Status: OK! I admit it! I rejoined the wiki just because of the upcoming 3DS games! 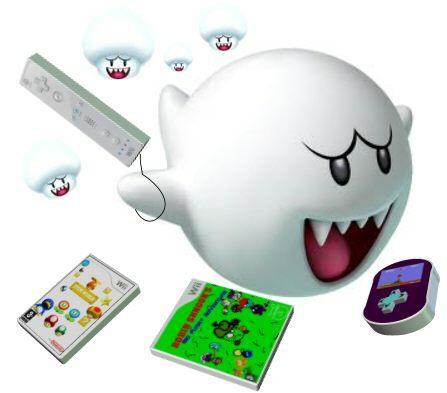 File:Boo playing Wii.jpg This user is Videoboo, THE GREATEST VIDEO-GAME PLAYING BOO IN THE WORLD. 100px This user says who needs Facebook? 45px This user thinks boos are the best enemy in video game history!!!. File:Sonic Icon.png This user thinks Sonic stinks. This user loves all the items. This user thinks Mario looks stupid like that. This user is on Bowser's side. This user thinks Mario should be dizzy by doing this. This user thinks Mario shouldn't dance at all! This user loves video game music (as long as it isn't boring). 45px This user would even hum video game music if he had to. Luigi looks stupid in this animated GIF file. This user likes the Minus World. File:Wii small.jpg This user has a Wii. This user likes the way Baby Luigi dances. File:Obesity Strikes.png This user thinks that Mario, Luigi, Baby Mario and Wario are fan n#1 of the Mc Donalds. File:ToadWart.gif Guess who this is! Clue: he is a fatso. This user loves secret passages. This user alaways wants to EAT. This user thinks Mario's language is incomprehensible ( if someone told you: "oyé!!!" would you understand him?). 45px This user has and loves Pikmin 2. This user thinks Lumas are one of the cutest things IN THE GALAXY!!!. This user hopes the Shy Guys have a Nintendo 64. File:Rsbuzzy.gif This user also hopes the Spike Tops have a Nintendo DS. This user also hopes the Boos have a Nintendo GameCube. This user's favorite item is the Boo Mushroom!!! . 46px This user thinks Mario should be a notable Boo. This user thinks Mario should be the bad guy in more than just one game. File:Mariosk.PNG This user thinks that Mario should have different Game Overs. File:SPP SRex.PNG Poor Rex! I bet it found out what happened to his ancestors! This user's favorite Koopaling is Lemmy Koopa. 40px This user has been known to steal user boxes without permission. In fact, he stole this one from someone that stole this one from someone who stole this one from someone that stole this one from the personage who made it, and he didn't even ask! . This user thinks the Bowser Mushroom should appear in more than just spinoffs. This user plays the Rabbid series. This user thinks Fryguy should have appeared in Super Mario Sunshine. This user thinks he dances pretty well. This user wonders why Bowser was given as a present. This user also wonders why a Bullet would bring a Bullet launcher. 45px This little piggy made a house of straw. 45px This little piggy made a house of wood. 45px This little piggy made a house of bricks. Too bad the Big Bad Wolf would blow their houses down!. Link This user loves adding links to words. This user thinks that there should be a King Red Boo (or at least a user named like that)! This user thinks Goombas look cute in Super Mario 64. This user favorite Pixl is Cudge. 45px But he also likes Thoreau. 45px Same thing with Piccolo ♪♪♪. 45px And he loves using Boomer (Now I'm a terrorist). File:Brain small.png This user has a brain. File:Brain small.png Did you know that if you get punched, you lose neurons?. File:Brain small.png This user has been punched all his life. This User's bro. is COSMIcPikMIN & Items. This user is friends with BabyLuigiOnFire. This user is freinds with Pink Boozooka. This user is a friend of KoopaYoshi. This user is friends with Porplemontage! This user is friends of Dry dry bones. This User is friends with Fawful117! This user also has Chortles! This user is thinking about how Fawful is a Minion of Cackletta, but he has minions of all sorts and that maybye Midbus will become a main antagonist with a whole army. Dah dooh dee dah dah dah de.. wait, ARE YOU ACTUALLY READING THIS!?! Doo doo doo dah doo doo... AGAIN!?! Seriously, YOU MUST BE A PRO FOR READING THIS!!! Just go look at the next userbox. OK?!? The other Userboxes have no text, SO GO LOOK AT SOMETHING ELSE!!! Finally, I think you should skip 2 userboxes. I said SKIP 2 USERBOXES!!! SO DO IT NOW!!! Ok, fine. I'm sorry but if you want a prize, get it from the competition. Now shoo! This user is can fly(In a plane). This user's favorite Animal Buddy is Glower the Tadpole. So cute! 75px This user canot wait to get Paper Mario 3DS. This user likes making Jack-O-Lanterns. This user reads the Fake News section of The 'Shroom because he fears the wrath of Uncanny Mushroom! This user wonders what's behind a Shy Guy's mask. These Smileys are getting on this user's nerves. This user canot stop seeing Smileys. ☺☻☺☻☺☻☺ This user has caught a rare disease: the smilorite. It makes this user see Smileys evrywhere. ☻ This user has gotten rid of the smilorite. Now, back to the starting point. What's behind a Shy Guy's mask?. This User likes colors . This user lives in a Ghost House. This user thinks Mario is EXTREMELY unlucky. This user does not think Mario is fat. When this User is not thirsty, he is hungry. 100px When this User is not hungry, he is thirsty. So if this user is not hungry and not thirsty in the same time, he would jump of joy! Actually, this user likes the Uncanny Mushroom! This User prefers the color red than green. 50px This User thinks Wario is disgusting. This user thinks Baby Rosalina should appear in a real game. File:GrácovitzRiendo.gif This user is on the cozy couch, sipping tea that laughs at you! This userbox tower is a stub. You can help Super Mario Wiki by expanding it. 45px This user thinks why does Wario smile all the time? 50px This user thinks the MarioWiki Bot needs freinds. This user HOPES he is not gonna get blocked one day. This user thinks Waluigi should be turned into Mr.Γ. USERPEDIA] This user is also on Userpedia. This user thinks that Nintendo should make the game pikmin 3. 50px This user really sympathizes with the Curiosity Core. This user has a Weighted Companion Cube! 50px This user thinks that Pigarithm are cute. 45px This user thinks Paratroopas are more than just Red Koopa Troopas with wings. They are just Red Koopa Troopas with wings AND dark glasses. This user ran away after seeing that 2 floating eyes were reading his personal journal. This user is one of King Boo's best Boo's. This user has escaped the Poltergust 3000. This user made this randomly. File:Box open.png This user needs more userboxes. MORE, I tell you, more!!! Muhahaha! Hi! I'm VideoBoo, I'm just a Boo that loves the mario series. I found this wiki when me and my bro were Mario crazy and we looked up images of Goombas on google, and you know how when you click on an image on google, it shows the site that it belongs to. Then we found this wiki I'm like a video game addict and whenever I hear about a game that seems fun, I WANT TO GET IT THIS INSTANT!!! Don't be shy (like my species) to talk to me, I acctually like getting messages. And to tell you the truth, I would be happy to make a page for un-autoconfirmed users. But you should talk to me too. I wish I knew who was online. Wait! I just bought an up to date whosonline. Oh yeah, if you want information on my bro. see here. As a Boo I like having Boo Mushrooms around. I even have a list dedicated to my Boo Mushrooms. "Boo Mushrooms" here are my boo mushrooms. the Boo!!! Yeah! there so cute!!! And I think they are FUNNY!!! definetly N1#!! Eeeheeheehee! Chain Chomp I like them for acting funnily, and I like dogs. Ruff ruff! N#2. Shy Guy Wow! I like there Mask! And I like the "mystery" of what's Behind the mask! N#3 too. Shoo-Rah! Bob-ombs oh Yeah Bob-ombs! I like their faces, And I wish there would be a wind-up Bob-omb toy! N#4 BOOM! Hey! Now that I think of it, There was a mix-up! It was my 6 favorite enemies! Eeheeheehee! Quick! Whoever is reading this must write down his answer immeadietly! I haven't got much time! Seriously! A Goomba has been squashed! the Society Of Creatures and the Koopa troop (SOCK) hired a detective to find out who did it! The suspects are down there, and they all have there own little story. How could I have a done it? I olny a squash Goombas when Peach is kidnapped! And Peach is right a next to me! Why do you think I'd stomp my own troop? I swore I wouldn't just stomp a minion for no reasons! It's just as true as how none of my children have a purple shell! I agree that I don't like Goombas, but hey! Goombas used to be freindly with toads so I should. I prefer eating Goombas then squashing Goombas. Now before the second of January you have to give me the name of who you think is the culprit! And the person that guesses correctly will get his prize. And what if more than one user gets the right answer? The first user that said the right answer will win the prize. See you soon! Oh, and P.S. : When you tell me who the culprit could be, you have to tell me the reason that you think it's him. So if you chose the right suspect but the wrong reason, that counts as a bad answer. I think I'm going to call him Inky. I hope Inky will have fun. Don't forget to feed him while I'm away. Oh wait, I've already hired a nanny to feed him gumdrops. I'm woried if Inky is lonely, so I'm searching for a Cheap-Cheep! You get it? Eeheeheehee! Look, I know that I didn't play many Mario games, but it's because my parents don't want me to get too many un-active video games. Super Mario Kart The game was horrible! the graphics where horrible, I was way too confused because of the graphics! I'm happy I don't own it. Super Mario Galaxy 2 Its the BEST GAME EVER!!! I rediscovered the art of 3D!!! No wonder Super Mario Galaxy was replaced by this game!!! I love this one. It's the Luigi's Mansion Beta theme song. I like this glitch, but the part when Baby Mario whines gets me irratated. Mickey was much better before right? Too bad that now he's just for kids of 2 years. Well at least they change that in Epic Mickey. Do you own that game? For some reason, I added a non-Youtube video on the You tube section. Hi evrybody!!! Now, I wondered if any of you are feeling gloomy, or sad, or wanting to cry, etc, etc, etc... So! If any of you are feeling like this, We've got Game Guy here!!! Game Guy will be telling jokes, so you will have to listen to him carefully. Heh,heh... I think the bowtie looks good on me. Alright. now, three people find a servant that would do anything you ask him to do. Right, so a greedy fatso asks for Gold, and of course, the servant gives him what he wants. After Wario goes away with his moolah, a Star bit hating Monkey asks for bananas, and the servant instantly obeys him. The Chimp eats the bananas and goes away. Then a weird brown mushroom was going to say what he wanted but he sliped on a banana peel and says: "Shoot!" So Bootler takes a Super Scope and s***ts. Yeah, so three Bandits are going to be executed, and when the executer arrives, the first Bandit shouts: "TORNADO!!!" ,and evryone hides, and the Bandit escapes. When evryone realizes the Bandit was lying, the executer decides to execute the second bandit. But right at the moment the Bandit is going to be punished, he shouts: "Raining Debris!!!" ,and evryone hides, and the Bandit escapes. When evryone realizes the Bandit was lying, the executer decides to execute the last bandit. The executer gets his bow and says: "One, two, three...' and the Bandit says: "FIRE!!!" So, it's Yoshi's birthday, and he invited evryone he knew, even if some of them were his enemies. Then a Beanish guy arrives and gives Yoshi a Present. Yoshi is happy to see such a big package, and then he asked the Beanish: "Is it a cake?" The Beanish says no, and then Yoshi notices a liquid coming out of the box. He licks the liquid and says: "Oh I get it! It's a jar of pickles!" Then the Beanish looks at Yoshi with shock and says: "Uh... It's a puppy." There. I hope you liked my jokes, because you have to pay. Yoshidude99 (that's him) and his pal, VideoBoo (that's me), were hanging out in an arcade playing video-games. They were so willing to complete the game that they didn't realize the arcade was closing (how normal). Once they finished their games (or in VideoBoo's case, lost it) they found out that the arcade was closed VideoBoo said: -"Let's play that game!" He was talking about the multiplayer game called "Eat the pizza 2". It was basically like the "Snake" series (see []) exept that you eat pizza instead of dots, and there were enemies that olny blocked your way. -"This is boring" said Yoshidude99 -"Wait!" said VideoBoo "Look at that button over there. I'll press it!" Before Yoshidude99 could react, VideoBoo pressed the button. Then they were transported into the video game. Inside the game, the enemies were very vicious, and almost K.O.ed VideoBoo, but they found out about one of the worst part of it: the snakes. They were really fast. faster then a jet plane. after avoiding getting eaten, Yoshidude99 found a little crack on the edge of the screen. He and VideoBoo joined forces to break it, and when they did, they found 200 Boos working endlessly. They were trapped in that game by Weegee, to power it up. Before the captured Boos could say more, The snake came charging like a freight train. Evryone backed up (apart for VideoBoo, confused). Then he smashed the wall, and became unconsious. Evryone got out from it (even a flatten VideoBoo). When they were Finally free VideoBoo said: -"Let's play that game!" No wonder Luigi is thinner than Mario (Its-a-me_Yoshi! 's idea). Now, I always wondered why tears could be so happy, or wait, IS THAT A TEAR!?! Kirby talks: "Hey! (puff) I thought I was the one who was meant to (puff) do the eating! (puff)"
Anyone joining the squad gets a new userbox. Put image of your boo shroom here This user is a member of the Boo Shroom Squad. PS: Whoever joins this squad will get a Boo Mushroom, but he has to tell me which type exactly (like the normal Boo Mushroom, the red one, the blue one , the green one , the yellow one , the fuzzy one , the kingly one...). This will be the "Boo Shroom Squad's" HQ. So you can see why it's so expensive. Well, I sure hope you liked my page. What are you waiting for? LEAVE NOW!!!!!!!!!! Now, as I said, I sure hope you liked my page. And whoever is reading this talk to me.